Bros.), director Peter Jackson’s trilogy of films based on Catholic writer J.R.R. Tolkien’s 1937 fantasy novel “The Hobbit, or There and Back Again” reaches a rousing finale. Mixed opinions have been generated by Jackson’s transformation of a single, relatively slim volume into a trio of longish movies. But few will deny that this concluding screen chapter progresses at a steady clip and successfully engages viewers’ interest — even if newcomers to the story are not offered much in the way of explanation or exposition. On a deeper level, the climactic struggle of Jackson’s wrap-up chronicles between the forces of good and evil, both within and surrounding its characters, offers valuable lessons for those moviegoers mature enough to endure the narrative’s many armed confrontations. An early example of these frequent clashes pits heroic human warrior Bard (Luke Evans) against the fearsome dragon Smaug (voice of Benedict Cumberbatch), the bane of many in Tolkien’s imaginary world of Middle-earth. As those well-versed in their Hobbit lore will know, it was Smaug who long ago exiled the hearty but stubborn Dwarves from their ancestral mountain bastion of Erebor. 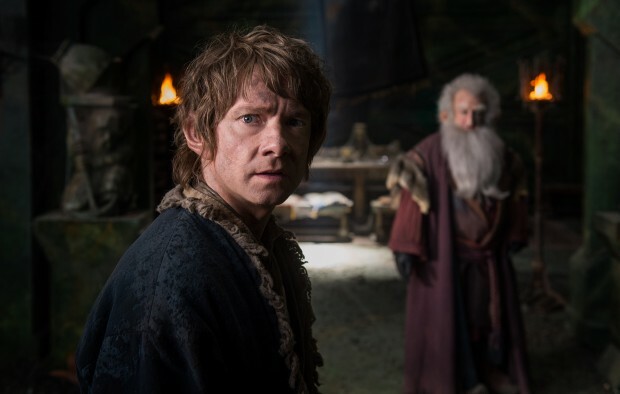 After Bard takes advantage of a hidden vulnerability to slay Smaug, accordingly, the Dwarves’ quest to reclaim their fabled citadel — a mission on which they’ve been skillfully aided by the formerly fainthearted Hobbit Bilbo Baggins (Martin Freeman) — reaches a successful culmination. But no sooner have the Dwarves recovered their stronghold than the untold wealth stored up there begins to obsess their king, Thorin Oakenshield (Richard Armitage). It’s a particularly inopportune moment for Thorin to be plagued by the hopeless greed and paranoia that are symptomatic of “dragon sickness,” since a vast army of evil Orcs, led by their odious chief, Azog (Manu Bennett), is on the march against Erebor. With their natural opponents on the verge of war with each other over Thorin’s refusal to recognize anyone else’s claim — however just — to a portion of Erebor’s treasures, the Orcs’ malignant plan to reestablish the dominance they once exercised over the whole of Middle-earth looks likely to succeed. All the more so once the dire warnings of Bilbo’s wizard mentor, Gandalf (Ian McKellen), appear to fall on grievance-deafened ears. The script for this combat-heavy parable — on which Jackson collaborated with Fran Walsh, Philippa Boyens and Guillermo del Toro — poises the warping effects of avarice against the redeeming consequences of heroic selflessness. Teens and grown-ups alike will profit from seeing these contrary traits weighed in the balance, even as they enjoy the picturesque adventure that provides the backdrop for such affirmative moral reckoning. The film contains pervasive, sometimes harsh battle violence with minimal gore and a couple of crass expressions. The Catholic News Service classification is A-II — adults and adolescents. The Motion Picture Association of America rating is PG-13 — parents strongly cautioned. Some material may be inappropriate for children under 13.